A waft of expensive perfume cuts through the smell of dried fish and the dust from building sites along the boardwalk of downtown Kota Kinabalu, Malaysia. A young tourist (flying a mainland Chinese flag from her Louis Vuitton suitcase) is lounging on the water’s edge in a white designer full-length gown, her Jimmy Choos placed carefully to one side. 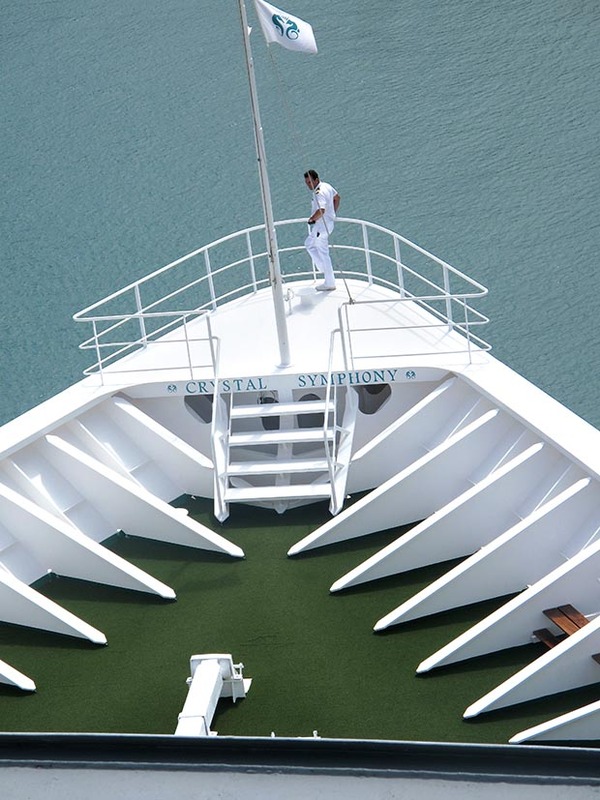 A crew member mans the bow of the Crystal Symphony. It’s a bizarre location for a fashion shoot. The tourist is facing Gaya Island, home to a water-village shantytown of thousands of illegal Filipinos who fled the Marcos regime of the Philippines in the 1970s and 1980s. Her dress is more valuable than the ramshackle fishing boat that putters past in the background, rust obscuring its bright yellow paint job. Kota Kinabalu is the capital of Malaysia’s Sabah state on the island of Borneo and one of the country’s fastest-growing cities. Construction cranes dance in the skyline of the city, formerly known as Jesselton (under British colonial rule), which was occupied by the Japanese in World War II and bombed extensively by the Allies. 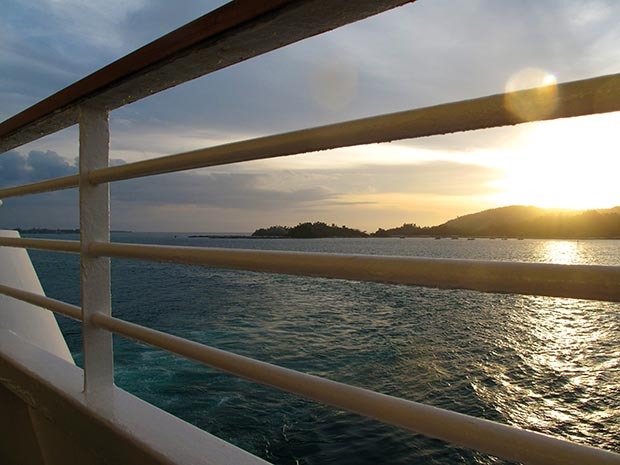 The ship’s luxury fittings are a contrast to the rusty fishing boats in the harbour of Kota Kinabalu. 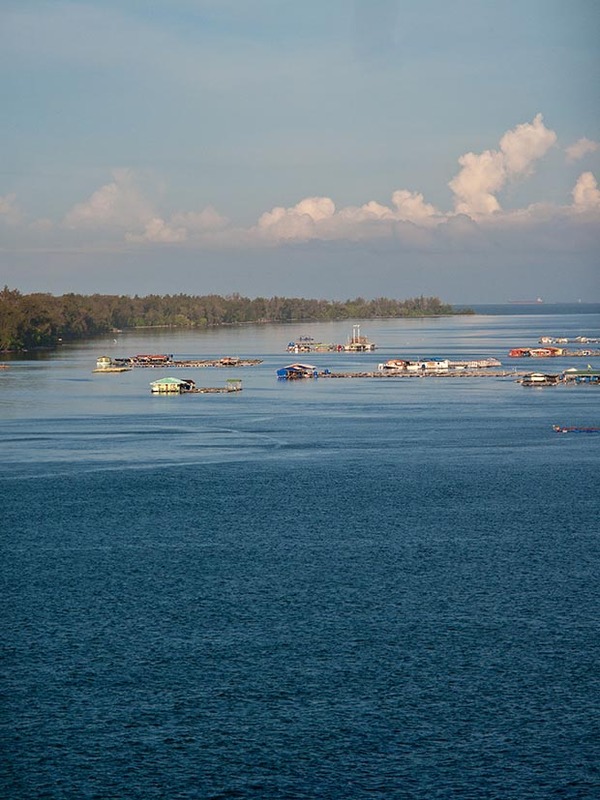 What was once a quiet port city, facilitating Borneo’s rubber trade, is now a bustling resort town close to marine and orangutan sanctuaries. But I have no time for those attractions on this trip as my friend and I only have a few hours before our cruise ship departs. So we launch right into the deliciously discombobulating central-city heart of Kota Kinabalu (known to locals as KK). At the handicraft market, a man makes a pair of trousers on an ancient sewing machine powered by a hand crank. He grinds away just metres away from a luxury shopping “hyper mall” gleaming with electronic gadgets and packed with designer clothes. 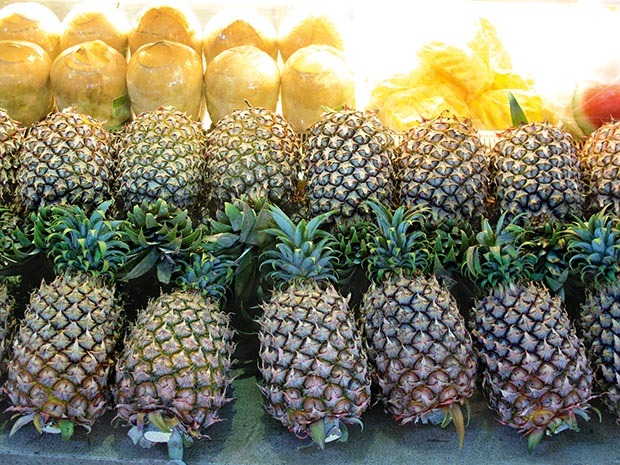 The shopping complex’s life expectancy is threatened. It is plonked next to a domino row of old empty malls, each abandoned when the next shiny new one is completed. Like a crab that’s discarded its outgrown shell. 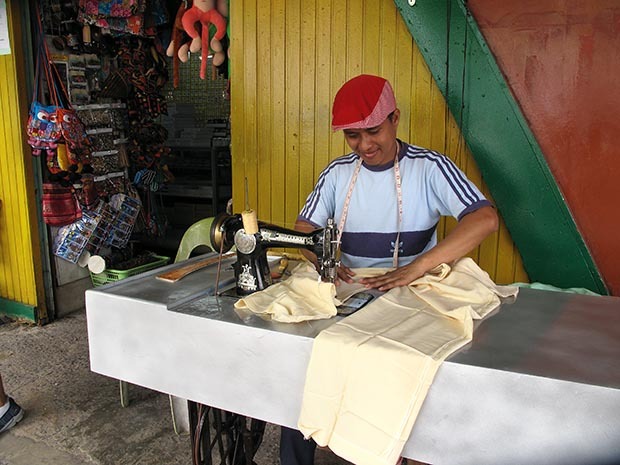 A local tailor makes his living using an old Butterfly sewing machine. “Why are all these shopping malls empty?” we ask our taxi driver. “People like new,” he says. What happens to the old malls? He just shrugs. 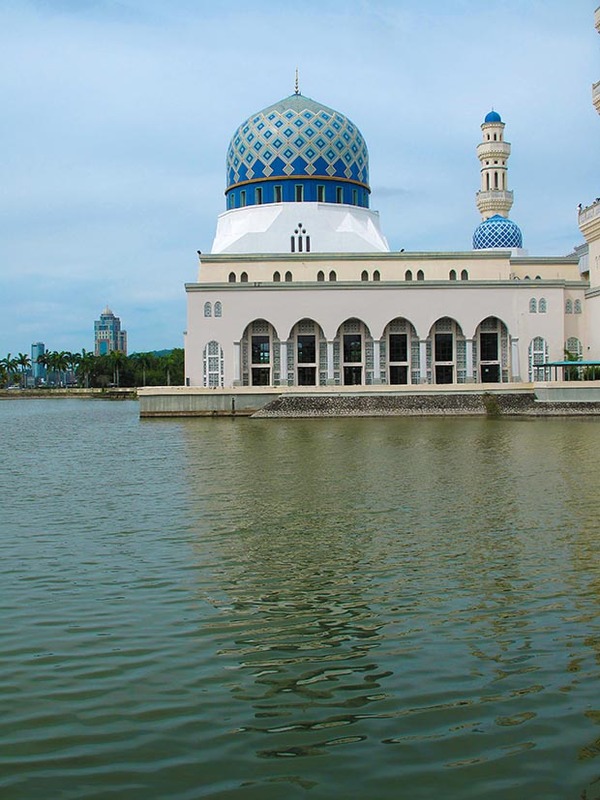 He takes us to the blue and white City Mosque, sometimes called the “floating mosque” because it appears to hover above the man-made lagoon. The City Mosque in Kota Kinabalu, with the Sabah State Administrative Building in the background. This elegant jewel in a hodgepodge city was built last century in classic Islamic style to resemble Prophet’s Mosque in Medina, the final resting place of Muhammad. On the coastal pathway from the beautiful mosque back to the ship, we pass a Great White Shark sculpted from plastic bottles. Weird. At the gangplank my pedometer reads 15,000 steps – not bad for three hours. Seeing the world via a cruise ship is speed dating. A quick get-to-know-you day excursion might end in a promise to return – if there’s an alluring spark. Kota Kinabalu was a fun but somewhat dishevelled suitor. 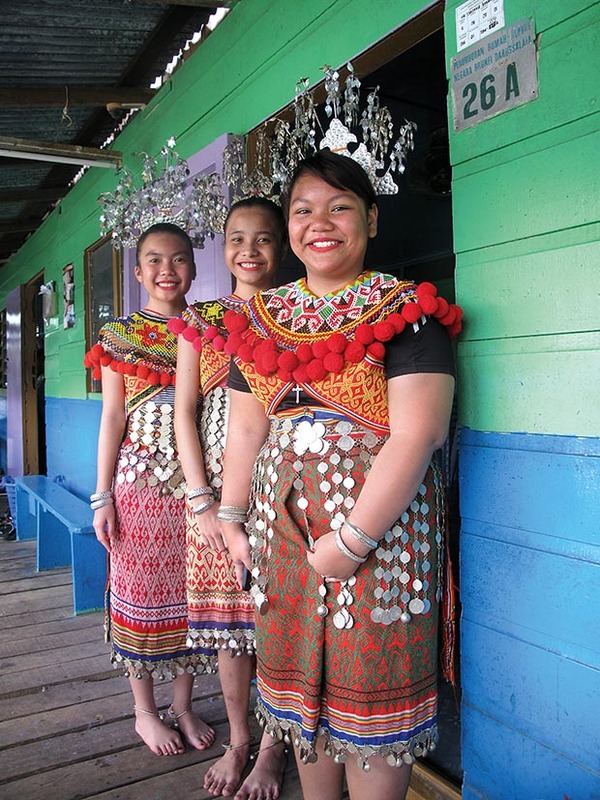 Exploring Brunei’s Temburong region by water taxi and long boat from This NZ Life on Vimeo. But our next destination, Brunei’s capital Bandar Seri Begawan, is handsome and traditional. We take a water taxi through rivers so dark and rich in tannin that the reflection of the boat travels with us as we dodge mangroves and reach the Temburong district. This area is an exclave – a territory separated from the rest of Brunei by Malaysia’s Sarawak State and Brunei Bay. Technically we crossed in and out of Malaysia eight times en route. Temburong is a rainforest reserve protected from forestry by order of the Sultan of Brunei, Hassanal Bolkiah. We pack into traditional longboats, steered by local Iban tribesmen who tackle the Temburong River rapids expertly, avoiding logs and rocks. We later see on the depth gauge that the water is only 30 centimetres in places. The towering riverside jungle vibrates with insect white noise and the occasional “oo, oo, oo” of the camera-shy primates. Dancers at the Iban longhouse. We visit a traditional Iban longhouse; these big rectangular buildings house entire extended families (of up to 100). The Iban people were once headhunters – that’s right, hunters of human heads. The skulls of enemies were a symbol of power and took pride of place in the longhouse. Matt, the local teacher and an Iban, says his tribe, K’ampong Tanjung Bungar, has converted to Catholicism. Although the skulls are now locked away, the tribe still performs dances linked with the heads. 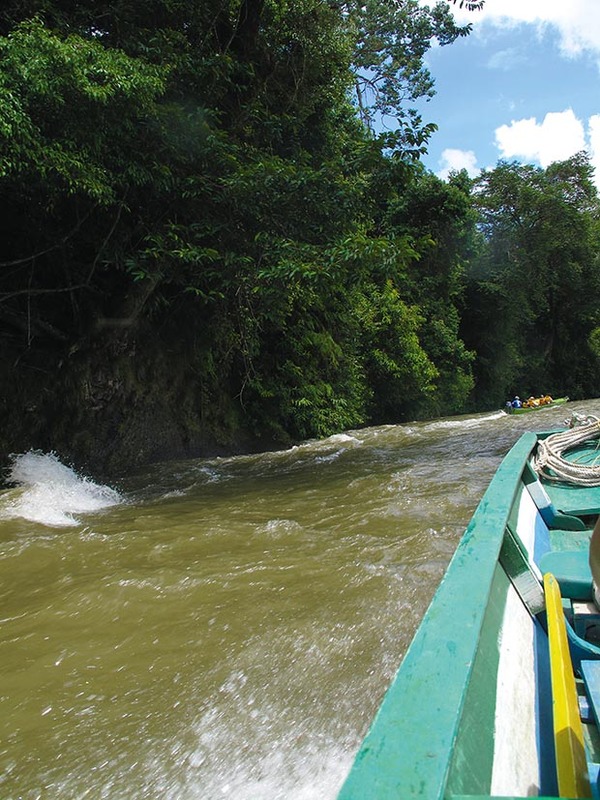 A longboat up the Temburong River offers a magical vantage point for the rainforest. Back up the river and in the capital, the gleaming pure gold dome of the Omar Ali Saifuddien Mosque is an unmistakable symbol of an Islamic monarchy. Other religions can be practised privately, but officially this is a Muslim state. There’s no alcohol sold, modest dress is required and symbols of Christianity holidays such as Santa hats are banned (if worn in public, a red hat like Father Christmas’ can earn a jail sentence). Sun set from Kota Kinabalu. The Sultan of Brunei is one of the wealthiest men in the world as a result of his large oil and natural gas resources. There’s nothing democratic about Brunei. While the people can’t vote and have no political power, they are granted free housing and university-level education. 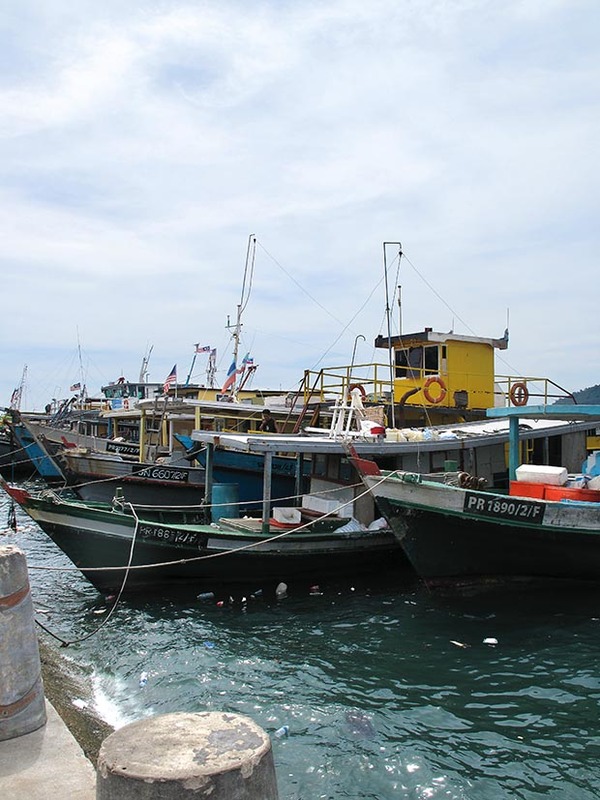 In spite of this state assistance, an estimated 30,000 citizens live in basic conditions in the Kampong Ayer floating village (in sight of the gold-topped mosque) ignoring the new, government-built stilt housing. Curiously, bus driver Min reckons many village citizens own luxury cars, which they park in the city. With petrol at NZ46 cents a litre, the cost of powering these expensive cars is of minor concern. The sun sets as we depart Brunei and we see another stilt village on an outer island and then, far out to sea in the deeper ocean, lurk the faint shadows of hulking oil rigs. Outside my plush penthouse cabin, Paolo my Portuguese butler waits in the hallway. “Ms Rawson, you haven’t asked me to do anything yet. Please, can I bring you something – whiskey, vodka, champagne?” He is pleading. I pause before asking for a power adapter. Relief spreads across his face. New Zealanders are bad cruisers, he tells me, and we’re too polite to ask for help. Australians are better; they’re more demanding. 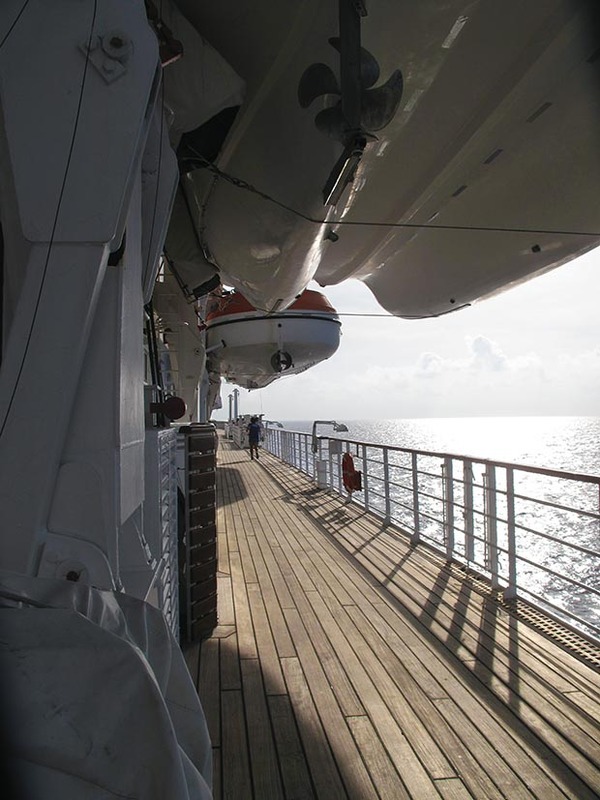 Watching the sun set while strolling the running and walking deck on board Crystal Symphony. 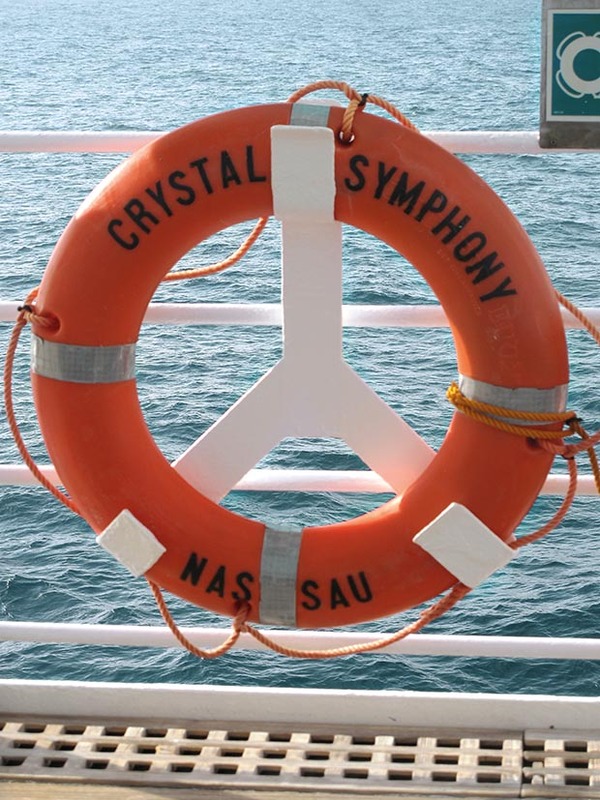 On our next day, which is an at-sea day, we cross the South China Sea to Singapore, so I suss out all 12 decks of the luxurious Crystal Symphony. It’s a small, intimate ship with just 900 passengers and it’s easy to become very busy doing very little while on board. And to eat too much; there are nine restaurants including Silk Road by world-renowned chef Nobuyuki (Nobu) Matsuhisa and an ice cream bar. Who needs breakfast when you can have gelato? 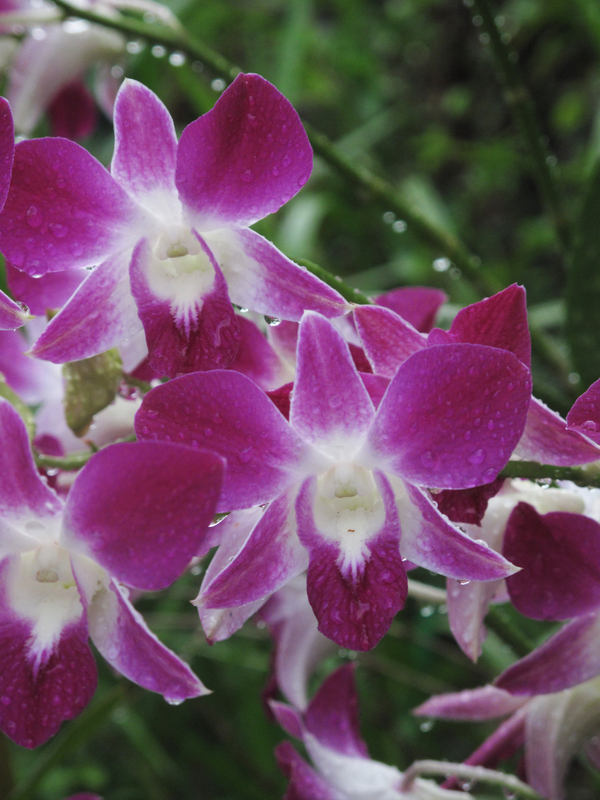 The Singapore Botanic Garden’s orchid breeding programme began in 1929. “My muffin top has turned into a cream puff.” Overheard on the Lido Deck. Have I also turned into a pastry? Off to a pilates class (harder than it looks when the floor is rocking). Los-Angeles-born pilates instructor Grace Wong may not have put on weight in her five years on the ship, but I’m off to run laps around the open deck. I’m running in circles, but gazing over the rails across the deep blue nothing is pure peace. Bronze sculptures La Famille de Voyageurs by French artist Bruno Catalano in the flower dome; Celebrity Orchid garden, where blooms are named after VIPs. Gone are the traditional fishing boats of Kota Kinabalu and Bandar Seri Begawan as we approach Singapore. Enormous cargo vessels float in the hazy humidity. On shore we’re met by slap-in-the-face-with-a-warm-flannel heat and monsoon-ish rain, so we don plastic ponchos and soon wish we hadn’t. It’s too hot, and ponchos are a terrible fashion crime in this ultra-trendy place. 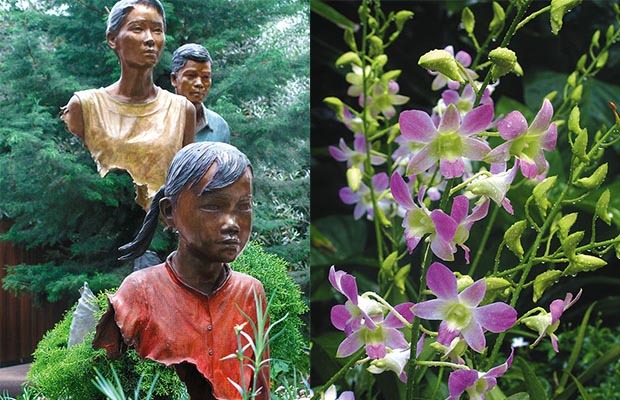 We’re off to marvel at the delicate beauty of the 1000 species of orchids and 2000 hybrids in the National Orchid Gallery at the Singapore Botanic Gardens. 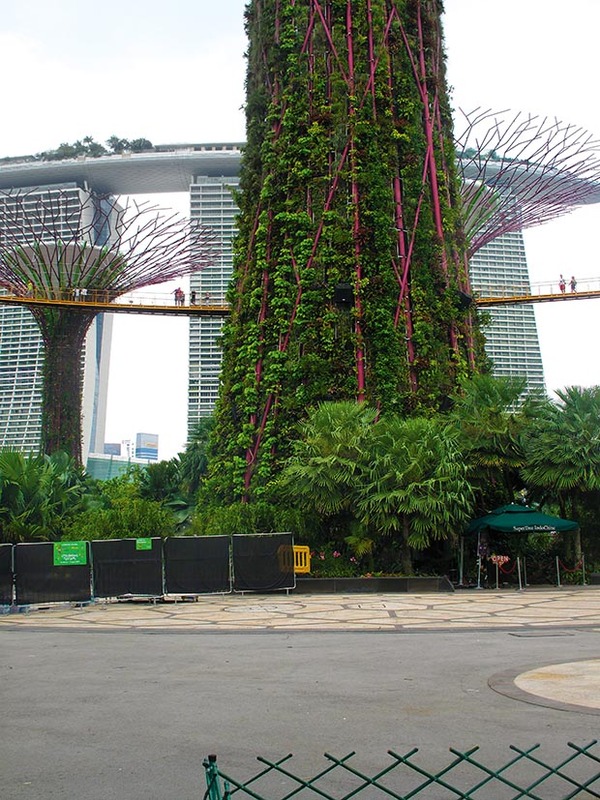 The Super Tree’s at the Gardens by the Bay dwarf the Marina Bay Sands Hotel. “Singapore is not a garden city, but a city built in a garden,” says our guide, aptly named Iris. The super-modern high-rises (emblems of this country’s economic success) are beautified with hanging plants and rooftop gardens rather like the symbiotic orchids of the jungles of Brunei. Gardens by the Bay visitors can explore the unique flora via pathways on multiple levels. Then there’s Gardens By the Bay. This garden super-centre is Disneyland for plant lovers. The Flower Dome is a 1.2-hectare chilled glasshouse for cooler climate flowers such as cherry blossoms. It is extraordinarily beautiful. 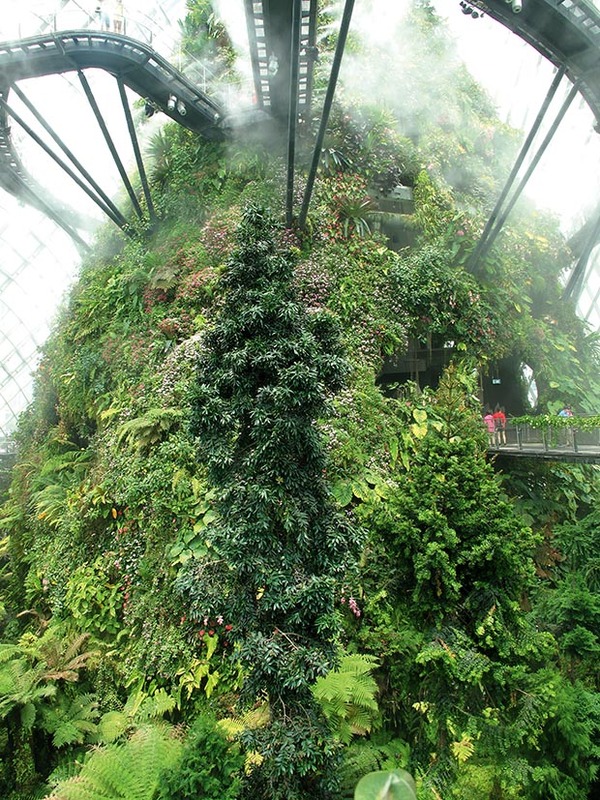 The Cloud Forest, a misty 35-metre mountain kept at 90 per cent humidity, is eerie and out of this world. But the showstoppers are the Super Trees. 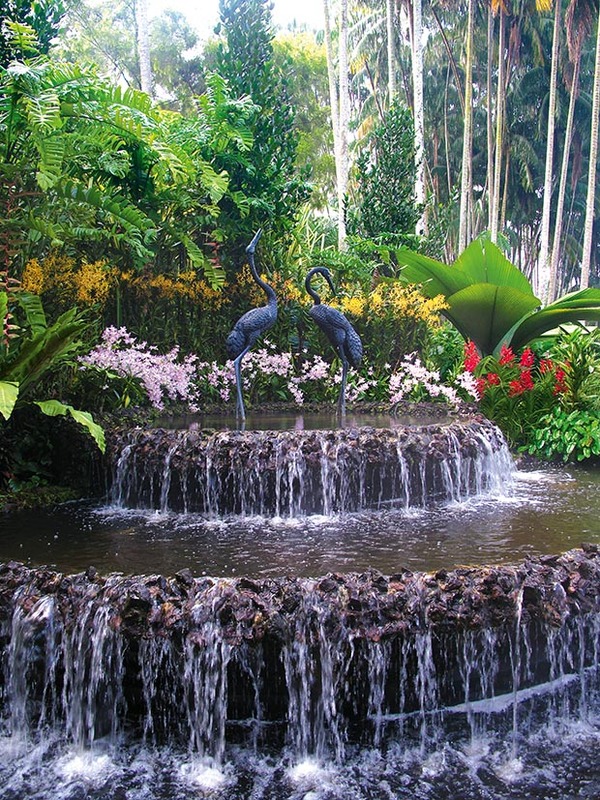 These 16-storey structures are planted with more than 200 species of bromeliads, orchids, ferns and climbers. The trees dwarf a dinosaur sculpture beneath. 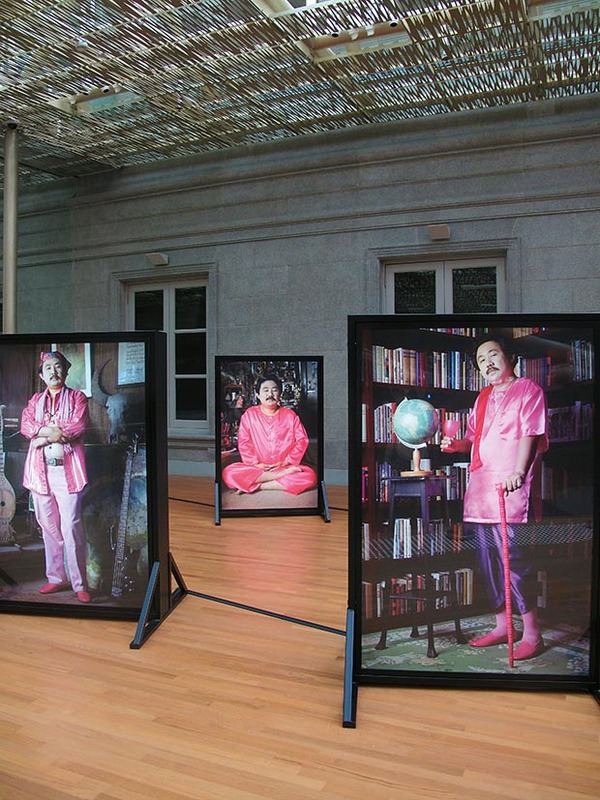 The Shocking Pink Collection by Manit Sriwanichpoom is a commentary on tourism and consumerism created during the 2007 financial crisis. Catch it at the National Gallery Singapore. But my date with Singapore is not over yet. I rush through the National Gallery, with its huge collection of south-east Asian art (oh, so cool), scoff satay and pig’s organ soup (less cool) at a hawker market, and taste tapas at the trendy Club Street in Chinatown, a haunt of the city’s many financiers. 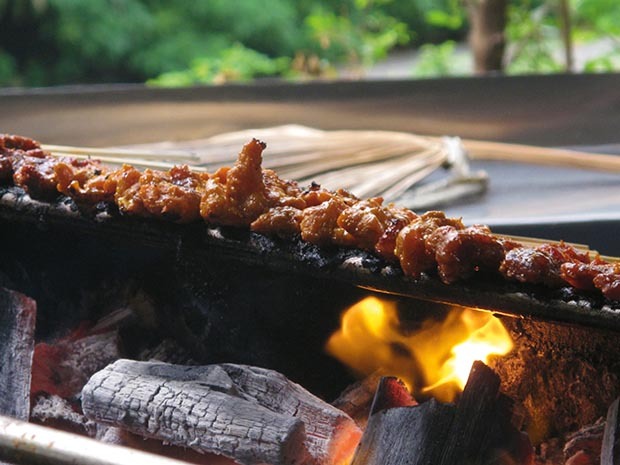 Singapore has a number of hawker markets but when in doubt, try the satay. Singapore is a bit of a hipster, both ambitious and green and filled with ideas… definitely second-date material even though it’s kind of a show-off. In my shipboard penthouse, I toast the city with a Singapore Sling and wonder while looking across at the city lights: Will we meet again? Coming soon: The ‘Across the Bay of Bengal’ cruise, aboard the Symphony’s sister ship the Serenity, travels from Singapore to Mumbai in March 2018. A tramp up Mt Kinabalu is not for the faint-hearted. Climbing to the summit takes several days, but there are day walks, mountkinabalu.com. Get up close with orangutans at the Sandakan Sepikok Orang Utan Rehabilitation Centre, 90 minutes’ drive from the city, borneoecotours.com. Fantastic snorkeling spots can be found at Mantanani Island, an hour’s drive away, mantananiisland.com. Tasty noodles at Yee Fung Laksa on Gaya Street; the food court at the top of the Wisma Merdeka Mall is packed with hungry locals, which is a good sign. Try the asam laksa, an intense, sour-tamarind version of a classic dish. 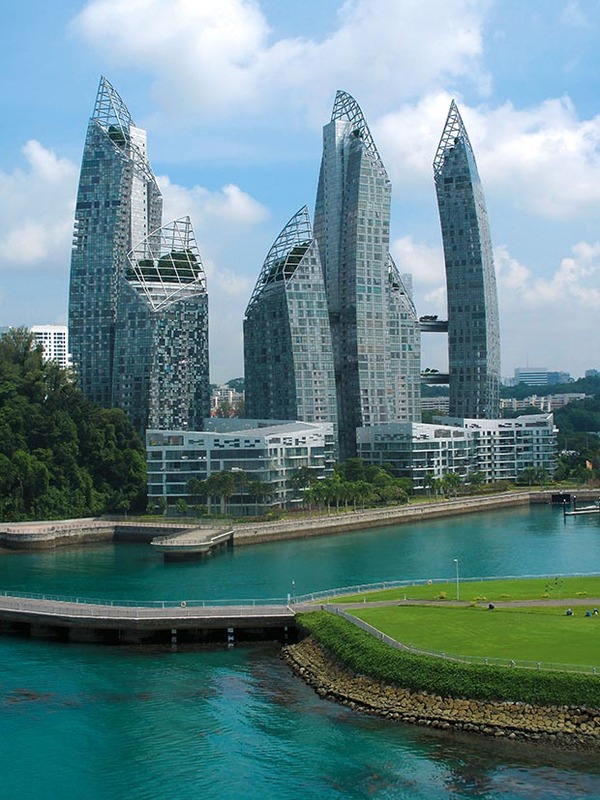 Singapore’s curved high-rises were designed by Polish American architect Daniel Libeskind. Explore the Temburong rainforest by longboat, freme.com. See golden treasures galore at the Royal Regalia Centre. Tamu Selera is a traditional hawker centre serving cheap local food, including ayam penyet (smashed chicken), under colourful tarps in a downtown park. Elephants graze in the grounds at Jerudong Polo Club, which serves traditional cuisine in an elegant indoor setting.